Hundreds of companies offer online incorporation services on the internet. If you need to incorporate, we can help you sort through their offers and different pricing structures. Basically, if you look for discount online incorporation service, what you are after is a good price. Most companies offer comparable prices, it is usually a matter of 3 issues: finding an incorporation service you are comfortable with, price and a company that will stay in business for a while if you want them to be your registered agent. Below is a list of companies that we fit the profile. Each of these companies does business in all 50 states, and offers competitive pricing. In fact, we had incorporated with one ourselves! Companies above have been in business for a while, and you can feel pretty safe if you incorporate online with one of them. 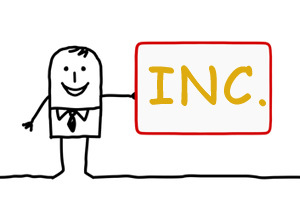 Online incorporation services often employ marketing gimmicks when they advertise their services. The most know is "hidden costs", i.e. providing additional services that you don't know you will need at a higher price. Read more about hidden costs before you incorporate online! Tip: Most small businesses start an LLC, a Limited Liability Company. Formation of LLCs far outpaces any other types, such as Corporation, by a significant margin. There are certain advantages - and if you form a small company they are significant - to LLCs. First of all, LLCs are not incorporated, they are organized. Most LLC structures have a lot less tax formalities, IRS looks at them as pass-through entities. Which means you as an owner, Sole Proprietor, will be taxed directly. However, you can also choose to elect an LLC to be an S or a C Corporation. Very commonly, all you need to get started as a small business is a Sole Proprietor, Delaware LLC, and a Federal Tax Identification Number, EIN.